Description: A wonderful purse sewing kit for starter, a complet kit with all necessary material supplies insdie to make a end product as picture show. With cute outlook, and useful for storing keys, cents, changes,...etc. small treasure. 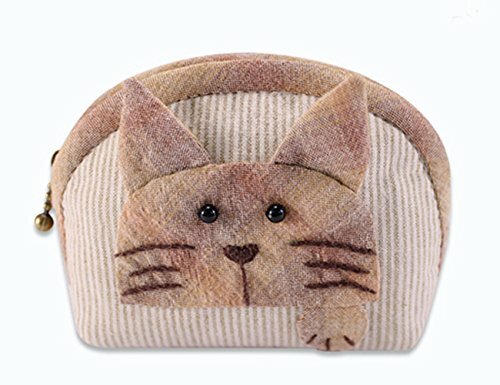 This is a craft kit that requires sewing. Manufacturer words:Sewing is a timeless work, it fixes things, creates crafts, discovers the beauty of life and brightens free time. Time spent on beautiful things is always worthy. Come and join us to craft amazing things. Can kid or grandma make it? Yes. We recommend kids above 8 years old. For beginner, please choose item with PROFICIENCY MARKED AS BEGINNER for an easy start. It's not necessary. Most customers sew all by hand, even for tote bag projects. Are there other things in need when start sewing? Yes. A pair of scissors, a marker to draw outlines, and an iron (not necessary). Why there is blue / white marks on the edge of fabric? Marks are water soluble, they are made as patterns before machines cutting fabric. How long will it take to sew? Well, it depends on the craft chosen. For beginner project, it takes about 2 hours to an afternoon, some tote bag may cost days. And with help of sewing machine, it gets faster. Easy sewing project kits with cute cat pattern, fits for beginner, starter, girls, women. When finished, it's a adorable purse for keeping cents, keys, changes, ..etc. small treasures. A complete purse craft kit with imported fabric, quality zipper, pattern, instruction, thread and needle. It's a unique craft gift whehter giving out as a kit, or as meaningful finished product, a surprise for receiver. If you have any questions about this product by SuSE Inc., contact us by completing and submitting the form below. If you are looking for a specif part number, please include it with your message.